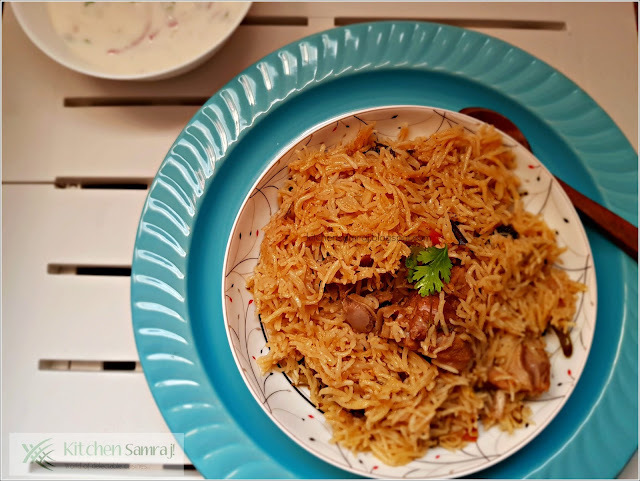 One Pot Mutton Biryani - a perfect biryani for beginners | Kitchen Samraj! Winters... for many reasons I like it💕.. and for many reasons I hate it😣.. tend to get more sick in this cold weather🤒... the icy cold wind has never been my friend and my lungs hate them😑... 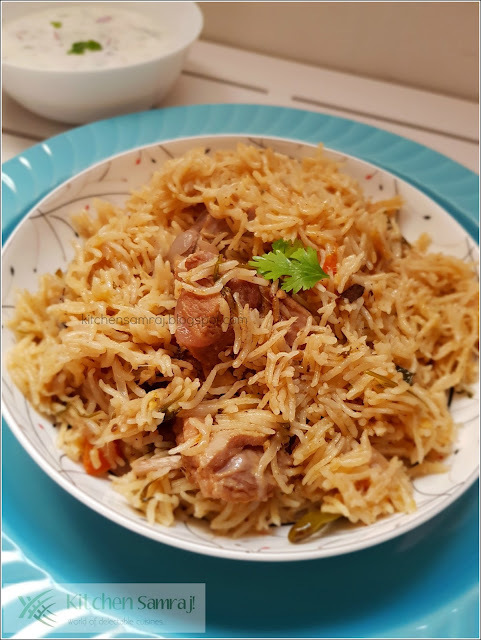 Under the weather since two days and since today is weekend wanted to make something spicy but easy to cook.. to open my taste buds which I feel are dead..
Had mutton in my freezer and I thought why not make biryani .... you must be wondering making biryani when sick?🤔..
Gone are the days when biryani s were made for special occasions.. for me if u want to cook something special but not so elaborate I make biryani🤗.. with a boiled egg and a raita lunch is served.. When biryani is put in dum.. the flavours develop you get an amazing biryani... which from start to finish will take you an hour and a half minimum .. If I say you can make a biryani with full of flavour that too under 30 minutes will you believe me? I made this biryani for the first time four years back.. when i had shoulder injury.. My right hand was in sling for 2 months... At that time I managed to find so many tips n tricks to make easy recipes.. and pressure cooker was my saviour.. on one such event I made this biryani with the help of my son who was 6 .. was quite amazed coz the biryani tasted just like regular dum biryani.. 💕💕... now I have made them many times when I am time pressed..
Clean and wash the mutton..
Wash the rice and soak it for 15 minutes.. Meanwhile place your 5 litre pressure cooker on the stove and heat it..
Add the onions and fry till they turn translucent .. in the oil that has separated add the red chilli powder and fry for fee seconds.. immediately add the ginger garlic paste and fry for a minute..
Add the mutton , coriander leaves, mint leaves, green chilli , salt..and sauce for 2-3 minutes.. add the tomatoes , turmeric powder , pepper , Garam Masala and the yoghurt.. mix them well and add about 100 ml water..
Close the pressure cooker.. and cook for 2 whistles in medium heat.. then lower the flame to Simmer and cook in sim for 10 minutes..
Switch off the flame and allow the pressure to come down ..
Open.. fluff the biryani. With a slotted spoon or fork. serve with raita ... Enjoy!! 5) never miss the simmer part . After two whistles reduce the flame and keep it in simmer for 10 minutes..